MT2, MT4, ST20, ST30, ST60, ST80 by Raytek. Enjoy tax free savings and fast shipping on the infrared thermometer of your choice. Save on all infrared non contact temperature measurement products. Available with laser sighting for quick accurate temperature measurement. 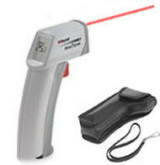 Infrared thermometer features laser sighting for fast accurate temperature measurement. With the exception of the Raytek MT2, all Raytek thermometers feature either single or multiple point laser sighting. This feature allows the infrared thermometer to quickly zero in on the target enabling the user to see the exact point of temperature measurement. Rugged and durable, the Raytek infrared thermometer is truly the choice of professionals and home users alike. Pistol like sytling, light weight and ergonomic design make non contact measurement a snap. Order your non contact thermometer today and save! Discount pricing on all Raytek infrared thermometer models! Click Here for all Infrared Thermometer models, pricing and specifications.